Headquartered in Houston Texas, TP&S operates seven branch locations strategically located across the U.S.A. The 152-acre Houston facility serves as the company's re-distribution yard and primary export facility due to its close proximity to the Houston ship channel. Technological advancements have permitted the entire 152-acre facility to be "wired" and yard crews utilize laptop computers to record information real-time. 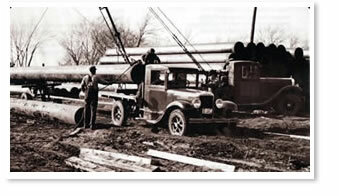 Texas Pipe is one of the largest line pipe distributors in the United States. Our leading position is a result of maintaining substantial inventories and the highest service level standards in the industry enabling our customers to enjoy the benefits of high productivity and industry leading inventory management. Customized inventories serving local markets are maintained at each branch location. Additionally, all locations provide a full range of added value services including cutting, threading, grooving, and coating. Dedicated inventories for the production, gathering, and transmission segments of the energy industry are strategically located throughout the country. Domestic and imported inventory is available at all locations in a complete size range from 1/8"- 60".